Il suo nome era Corbucci! There are very few things that I love as much as I love spaghetti westerns. Technically, these days they’re called “Euro-Westerns” because they’re made by German, Spanish, English, AND Italian filmmakers and studios, but in their '60s heyday they were also known by derogatory names such as macaroni, pizza, and pasta westerns. It makes me hungry just writing it. In the 1950s and the early 1960s, Italian cinema was an extremely popular and prolific business with the primary focus being on sword and sandal movies, and/or the adventures of mythological musclemen. These studios would follow the fads and trends of the worldwide movie scene and crank out their own contributions on a budget, using actors from different countries and dubbing them into the language appropriate to the country to which they were exporting the film. Also during this time, the American western was floundering. Once a mainstay of the U.S. film market, westerns saw a sharp decline in the late '50s and early '60s due to the popularity of television. Why pay money at the theater when you can get it at home for free and invest in the same characters each week? However, while the American audiences were sitting at home watching Gunsmoke, foreign audiences who wanted a fix of western action found themselves deprived of their once-ever-present genre. What was a European marketplace to do? As it turns out, make their own. Sergio Leone arguably started the whole craze with his 1964 trend-setter, A Fistful of Dollars. He married the landscapes of southern Spain with an American television actor (Americans were seeing Clint Eastwood each week on Rawhide) and the guitar pop score of Ennio Morricone, creating a new genre that would span hundreds of films and create a new type of movie that still casts a shadow today. Coming into film fandom in the mid-'90s, I was well aware of the significance of Leone’s Dollars trilogy, but I had never felt compelled to explore beyond his contributions until relatively recently. To be totally honest, no one made spaghetti westerns like Sergio Leone. He was a master who started AND ended the fad. But a few years ago, I went spaghetti western crazy and watched almost nothing but European westerns for a couple of months solid. What I discovered was that, while no one made movies quite like Leone, there are dozens of films that hold their own and are worthy of attention. If Leone had a contemporary, it was the OTHER Sergio, Sergio Corbucci. By the time that Euro-Westerns became a trend, Corbucci had been making films in Italy for over a decade. His greatest contributions during the '50s were in the sword and sandal/Peplum genre, but he’s responsible for many spaghetti westerns during the Euro-Western peak. He shot four films in 1966 alone, and was one of the most prolific directors of the time. Don’t tell anybody, but I might like his movies even more than I like Sergio Leone’s, because Corbucci’s films have more of a pop aesthetic and are shorter (usually around 90 minutes). And if you’re anything like me, your consumption of whiskey and cigarillos is about to increase 100%. 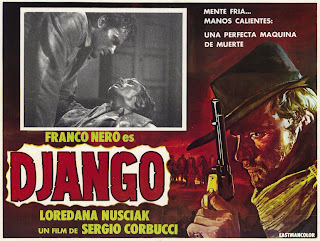 Corbucci’s first major contribution to Euro-Westerns (and my favorite of his) is Django, which came out after Leone’s A Fistful of Dollars and For A Few Dollars More. Because of this, Corbucci was able to make his film similar to Leone’s, but also markedly different. For instance, Django does feature the mysterious stranger who comes into town and plays two sides against each other, just like Eastwood’s character in Leone’s movies. However, where Leone’s films are drenched in sun and dust, Corbucci places Django in the cold and mud. The entire movie is overcast and cloudy, and every character in Django is covered in muck from hat to boots. 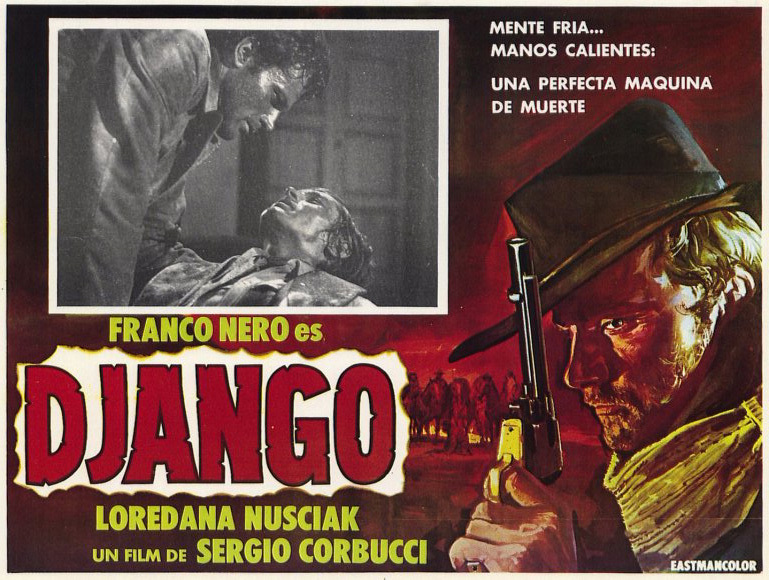 Django is pure comic book pop, as star Franco Nero comes into the muddy town dragging a filthy coffin behind him. Wearing a long black coat, hat, and wrapped in a scarf, he’s the stuff of sixties European pulp fiction. There’s a very deliberate and intentional shabbiness to the costume design that I really dig. He’s larger than life; he has a history, but we aren’t given very much of it. He drops clues to this past through the film, until we find ourselves at the end of the journey, knowing little more about him than we did when we started. Django is complimented by an incredible score by Luis Bacalov and a catchy, epic theme song sung by an American named Rocky Roberts. Quentin Tarantino’s Django Unchained is, in many ways, a remake/homage to the original Django, featuring much of Bacalov’s music and a cameo by Franco Nero. Tarantino, of course, took things to a whole other level, but he did use a framework established with this movie. Racism is a theme here, with a rich white man hunting Mexican men for sport. This bad guy even seems to have created a sort of cult or religion around his supremacist views. Corbucci’s film is also extremely violent, with a body count near 100. Few spaghetti westerns come together quite as well as Django does or are as interesting to watch as this movie. It’s one of the best, spawning dozens of unofficial copycat sequels that use nothing more than the name to cash in and connect to this first film. 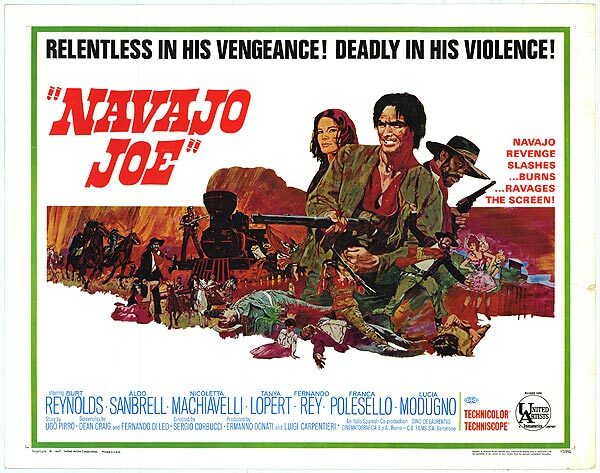 Corbucci followed Django with Navajo Joe, starring a pre-fame Burt Reynolds. One of the things that I enjoy the most about Corbucci’s westerns is that they feel very separate. He definitely does not repeat himself, and each new film brings a new setting, plot, and dynamic. In Navajo Joe, Burt Reynolds is a Navajo that has had his woman scalped and murdered and his entire tribe wiped out by a sadistic killer and his band of goons. Seeking vengeance, Joe hunts down the members of the gang and extracts his pound of flesh on each one, saving the leader for last. It’s not reinventing the wheel, but it works and is fun to watch. Navajo Joe is also very violent, but doesn’t begin to approach the body count of Django. This is a different type of movie, more of a slow burn. By the time Joe squares off with the killer of his tribe, we’re ready to see some justice. This justice is doled out to a screaming soundtrack (seriously, it’s made up of yelling and whooping) by someone named Leo Nichols. I had become quite a fan of Leo. He scores several of Corbucci’s films, and I’ve seen him pop up here and there with music that I found creative and unique, but still iconic. It was only last week that I discovered that Leo Nichols was a pseudonym for Ennio Morricone. It seems that Morricone was fearful of being criticized for being TOO prolific, so he started to use other names to avoid attention. He also did this to creatively free himself up to try new things without pressure to repeat his past successes. Morricone created LOTS of music for spaghetti westerns, and almost none of the movies were as good as Sergio Leone’s (or deserving of Morricone’s talent) meaning that there are many films with Morricone music in which that music is the best thing about the movie. The Hellbenders came on the heels of Navajo Joe. It takes place in the aftermath of the American Civil War, with Joseph Cotton playing a Confederate colonel who tasks his sons to assist him with an insane plot. This plot involves taking a bunch of bank notes from Union custody and using it to fund the reformation of the Confederate army, thus somehow ensuring a new start for the war and a victory for the south. Right. That’s not crazy AT ALL. Along the way, he kills quite a few Union soldiers, sneaking and deceiving his way across the countryside. The cinematography is beautiful, and there are several iconic scenes. The most striking takes place in a cemetery at night as the colonel and his men dig up a coffin. The score is also memorable, with a theme that gets in your head and stays there. 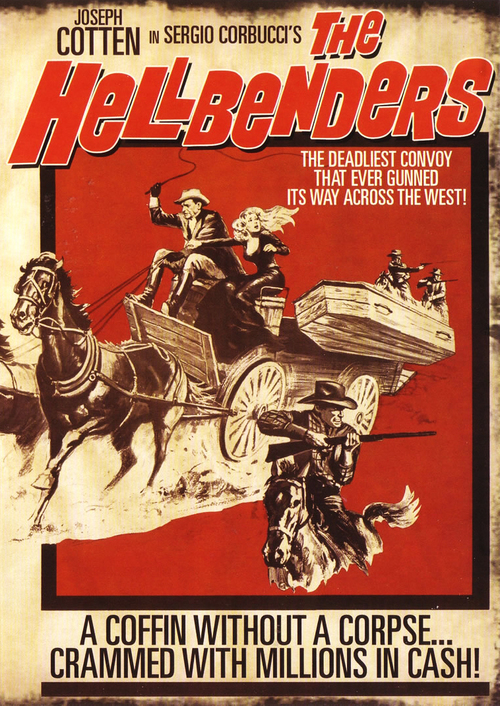 The Hellbenders is not a great movie, but I’m recommending it as evidence of the diversity of Corbucci’s output, for the cinematography of Enzo Barboni, and the score of Ennio Morricone (again under the name Leo Nichols). 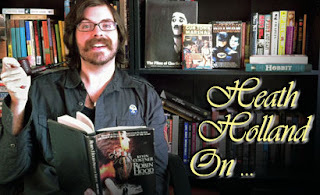 These three movies give an overview to the work of Sergio Corbucci, who made many more significant entries into the Euro-Western field all throughout the rest of the '60s and through the '70s (long after the fad was popular anymore). If you haven’t seen these and are looking for a fun way to spend a weekend, you could do a lot worse than these. Plus, if you haven’t seen these and you like them, there’s a LOT more where that came from. Finding all of Corbucci’s films is a monumental task, but well worth it. Right? Leone is great (I love him and want to marry him, but I'd have to dig him up first), but Corbucci did so many different things for so much longer. You could teach a course on all the different TYPES of stories he told within the traditional boundaries of "spaghetti westerns."